This was a fun year! 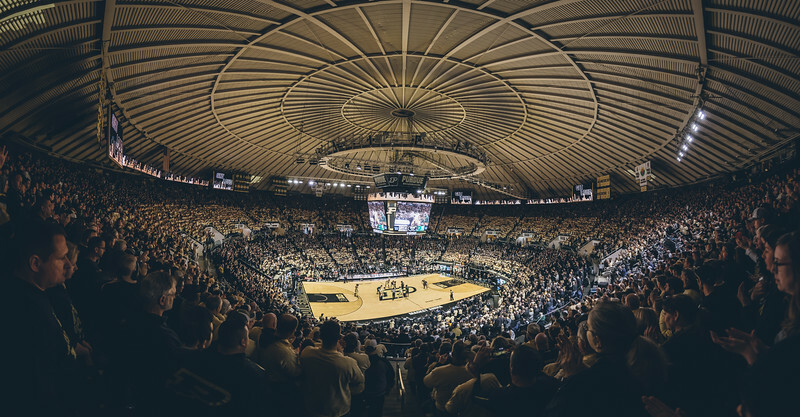 For the last couple of years watching Purdue basketball was something that I was rarely able to do live. When I made up my end of the year list it was from a handful of games. This year I had many games to pick from making this very hard to put together even with it being 19 images now. In mid-December nobody would have predicted the finish to the season that we saw. 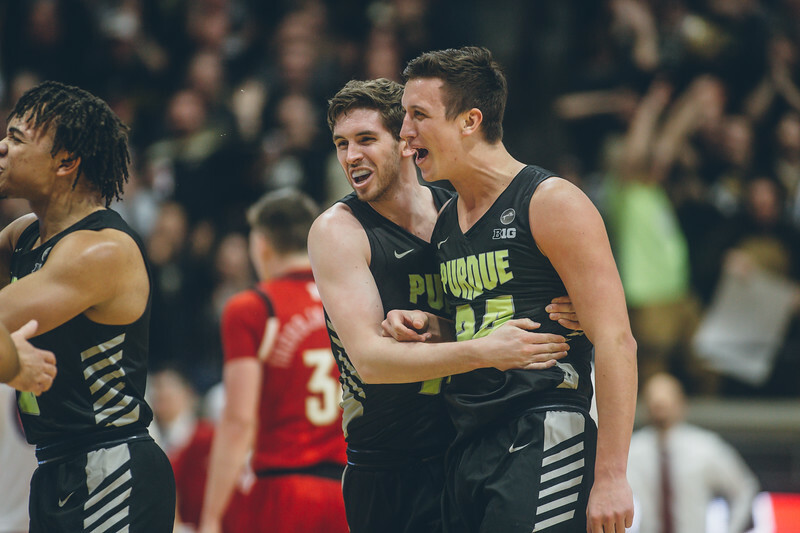 The Boilers went on an amazing run, and they were tenths of a second away from the Final Four. Here we are over a week away from that game as I write this, and it still hurts. If you had told me though as I left Banker’s Life Fieldhouse in Decemeber just what would have transpired this season I would have been all for it. I would have taken it in a heartbeat. This team was fun to watch. As with all of these countdowns the numbers are made up, and the places don’t really matter. This is just more of a way for me to go through my photos and relive the season. 19. Every list has to start here. 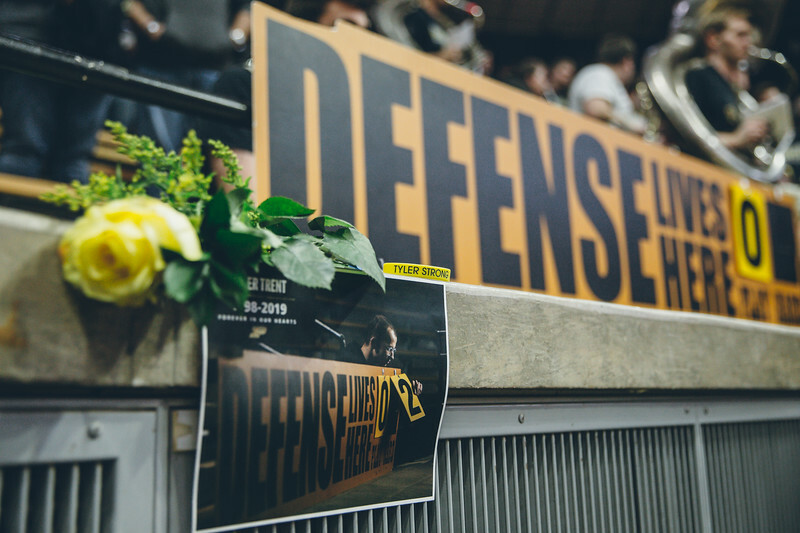 Purdue had just lost a tremendous fighter in Tyler Trent. I had just had something removed from my body as well although nowhere near the scope of what Tyler had. I should not have had a camera in my hands that day, but I went to the stadium anyway to make some photos. It felt like something that I should have done. I shot pretty much until I started bleeding and then went home. I ruined a shirt, but it was worth it. My pregame photos were not what they should have been because I was overcome with emotion as they talked about Tyler. He was a special young man that was taken way too soon. 18. I get to do some pretty cool stuff sometimes. This was one of those moments. 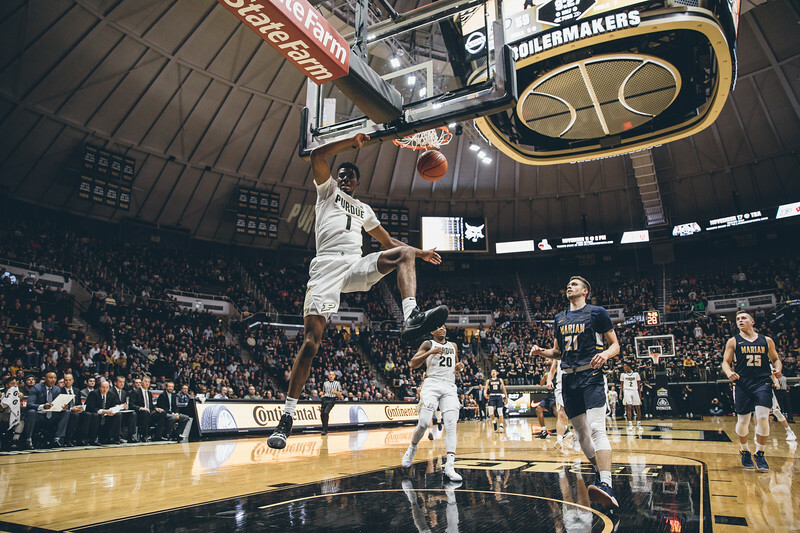 My first gig with Purdue this year was to cover the basketball alumni game. If you read my old blog then you would know that I was a huge Robbie Hummel fan. I just loved the way that he played the game. It was pretty cool finally being able to photograph him on the baseline. I shot way too long like it was a normal game, but it was worth it for this shot. 17. Sometimes it feels like you are picking the low hanging fruit getting a Matt Haarms celebration shot. He is so good at it though that you have to make images of it. He plays with such emotion that it just gets everyone going. The crowd feeds off of it too. This was my favorite of those shots from this past season. 16. I love the t-shirt game. Every year at least one photo from that night appears on this countdown. I made this panoramic image just before the tip off of the game. It is so cool to see the fans playing along and wearing the shirts. 15. It took this long to get to a Carsen photo. Don’t worry there are more coming. 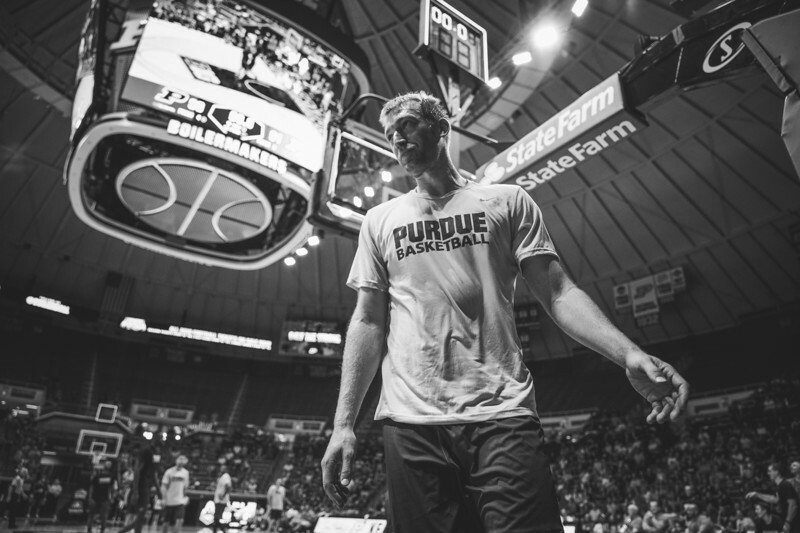 Carsen was a dynamic force that we were privileged to watch play at Purdue. The string of games that he put together in the NCAA Tournament were amazing. As I write this he has just announced that he will not return next season. You kind of knew it was coming, but thinking of what could be if he stayed made me wait until it was official before thinking about it too much. 14. The Paint Crew is amazing. 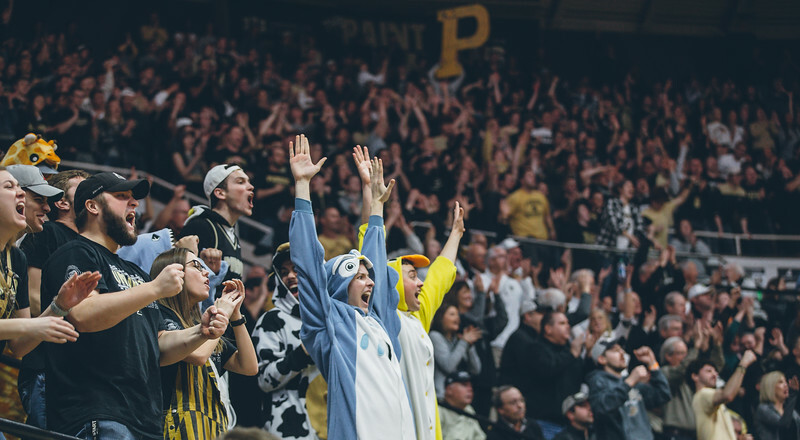 They are a very big reason why Purdue did not lose a home game this past season. They bring it every game. Here I decided to have some fun with them during the intros. I had a new 300mm lens, and I wanted to try it out a bit. This was a perfect way to do that. 13. I love shots like this that tell a story. This was made with a remote camera at my feet. I have the tight shot of the same moment, but I love how this has all of the information in it to tell you when it was made. When I set up a remote like this I don’t expect to get a lot out of it, but just enough to break up the gallery. The best ones often end up being my favorite images from the event. 12. I don’t always stick around to photograph the halftime entertainment. When it is a high flying act though I will do just that. These guys were amazing in what they did on the court. I loved how high he looks here. 11. 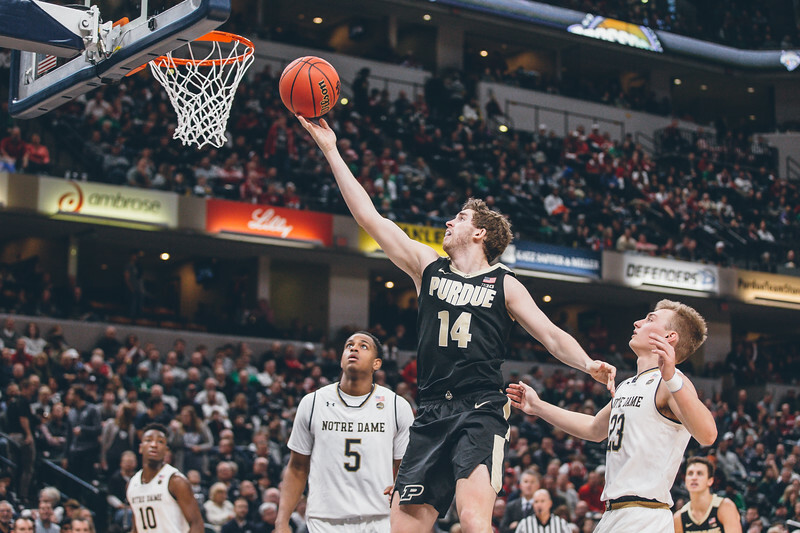 Ryan Cline had a great finish to his senior season. 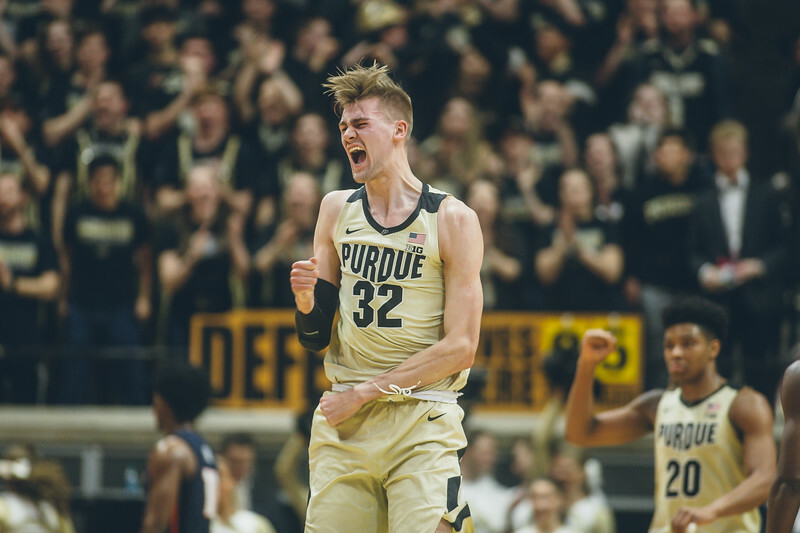 He made some amazing shots to get Purdue to the Elite 8. Here he drives to the bucket against Notre Dame in November. He is not known for driving, but when they gave it to him he took it. 10. Aaron Wheeler is a huge part of the future of this team. Here he dunks early in the season against Marian. I love these wider dunk shots for the story that they tell behind them. 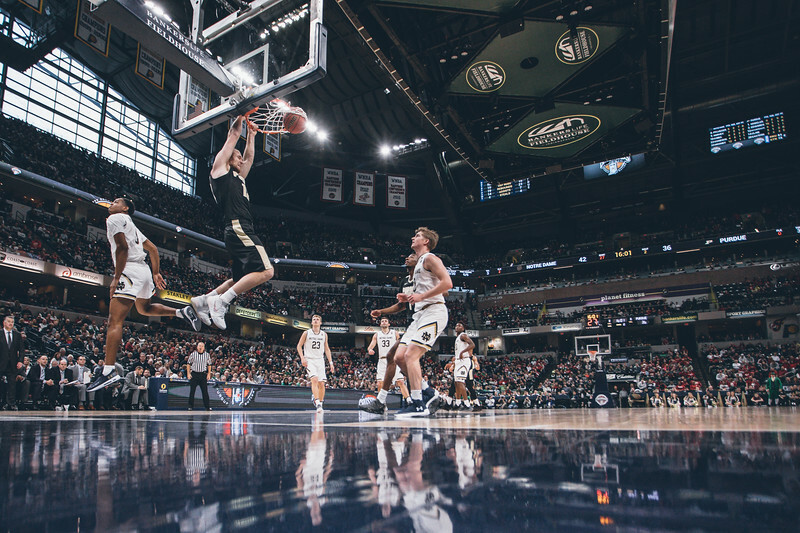 During the tournament the Purdue photographer Charles Jischke made a great dunk shot with the emotion on both sides in the background. 9. This shot was more accidental than anything. I was playing around with my 11-24mm lens during the first half of a game. I was hoping for someone to come and shoot from right in front of me like this. 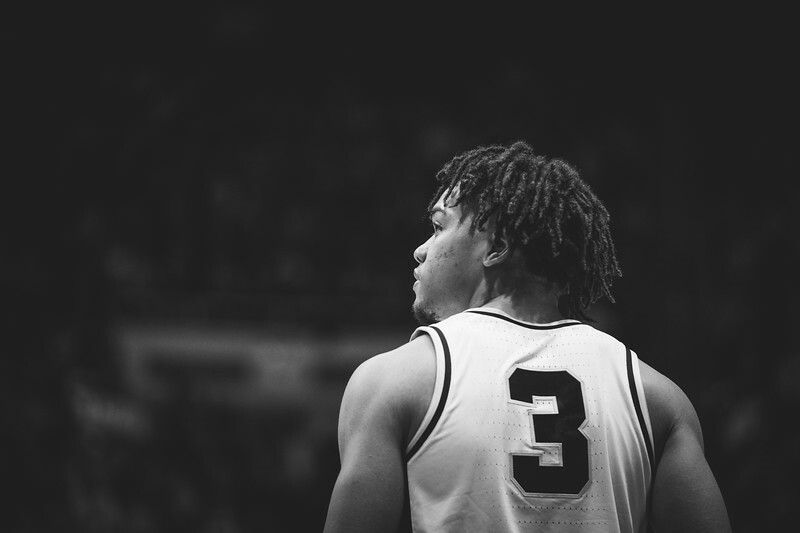 Carsen Edwards did, and I found that I really liked this shot. I think that during a season you shoot so many things that look the same that you really enjoys ways to make a different picture. 8. 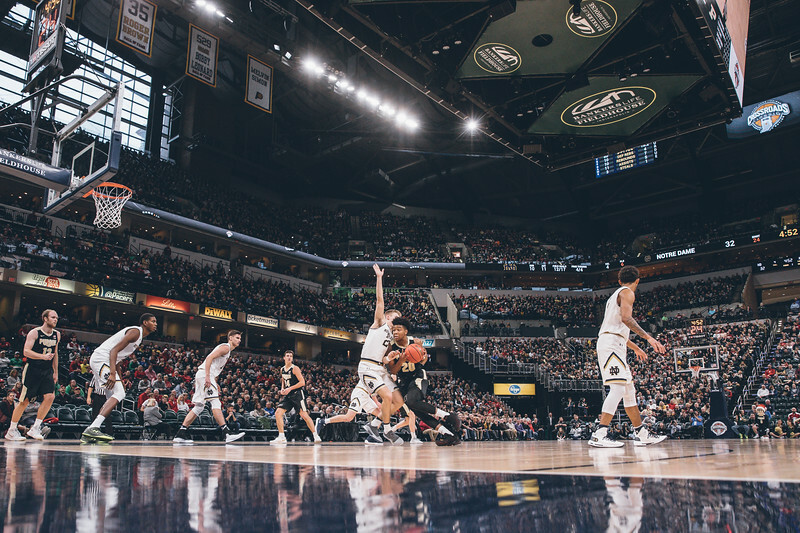 Here is another wide angle photo from Banker’s Life. Just like the photo earlier in the countdown you get a lot of information in these wide angle shots. Some good action in the photo doesn’t hurt either. I was so happy to shoot this game. I had not been to this event since it was called the Wooden Tradition. I was happy to be able to not only be there, but to also shoot the game. 7. Its wide angle madness! 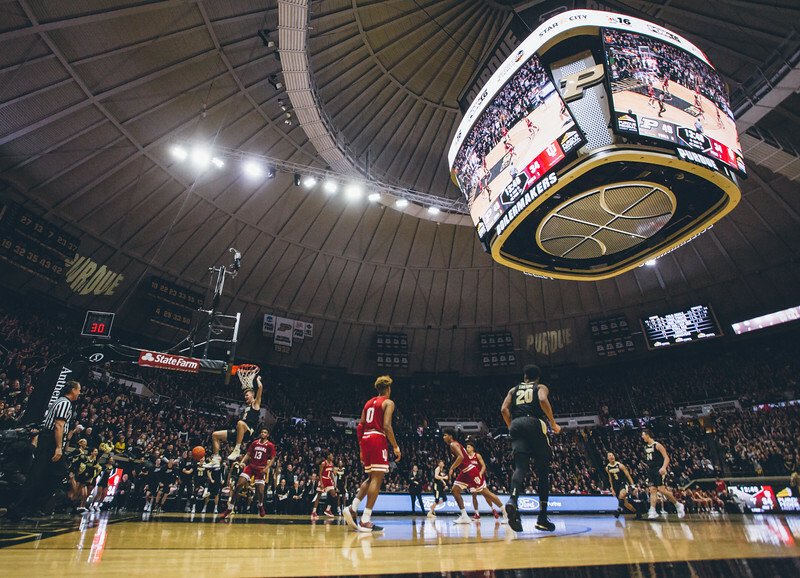 This is a frame that I made during the game against Indiana. I have a tight sequence of the dunk. I also have a sequence from this perspective. I just loved the emotion in the background in this frame made slightly after the peak moment. 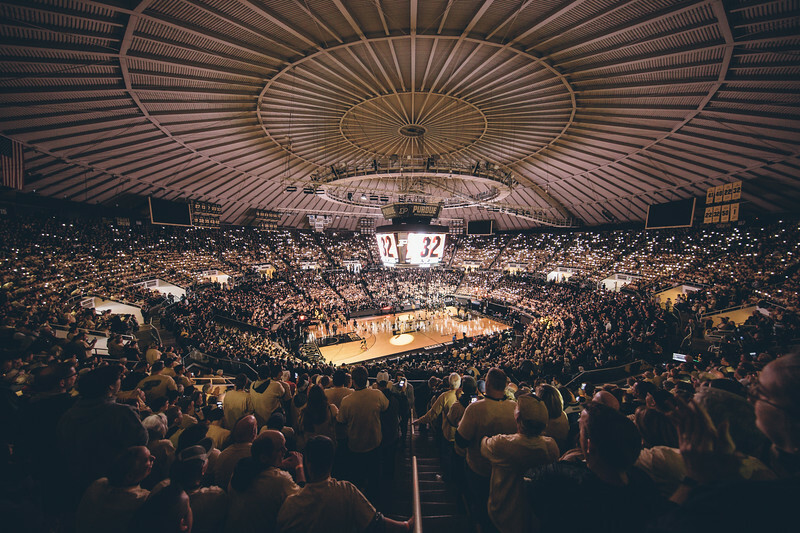 This was a huge game for Purdue, and part of a great home season. 6. More with the Paint Crew. These guys are just fun to watch. 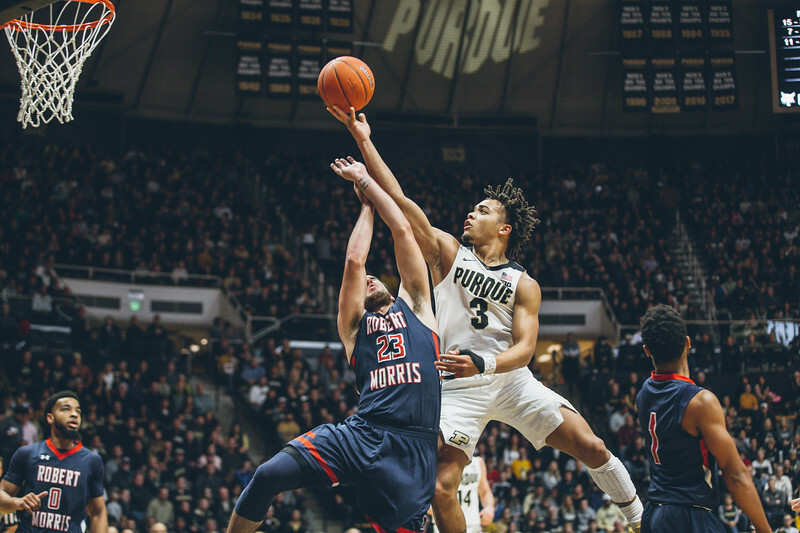 Here I had noticed the Purdue P in the background so I sat on this image until something really great happened. Then I let the crowd do the rest. 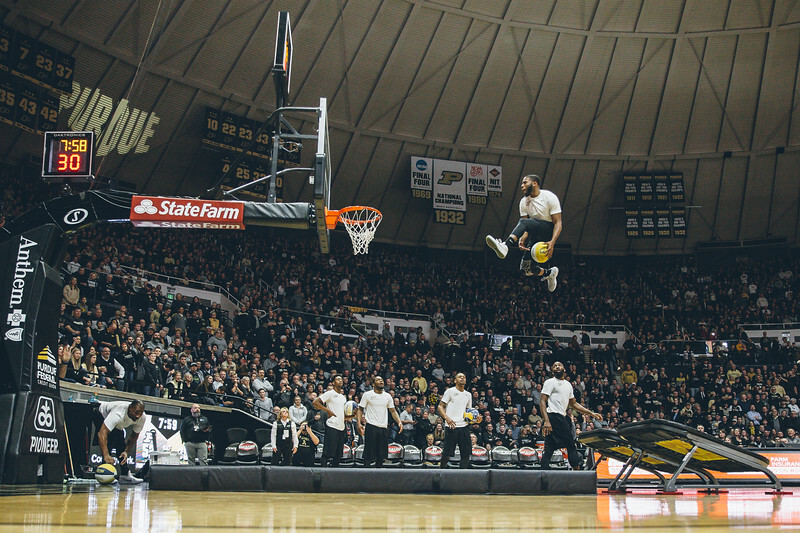 This season at Purdue I rarely was called upon to make peak action photos. If I made some then whatever. I really wanted to help the photo story from the game with images like this one. That may be part of the reason why I had so much fun shooting basketball this year. 5. This photo is why I call this my favorite images from the season. Technically it is not the best shot. The emotion between these two seniors though is something that I really love. They were the heart and soul of this team, and it was great to capture that in a photo. 4. When I made this photo I knew that I had something. 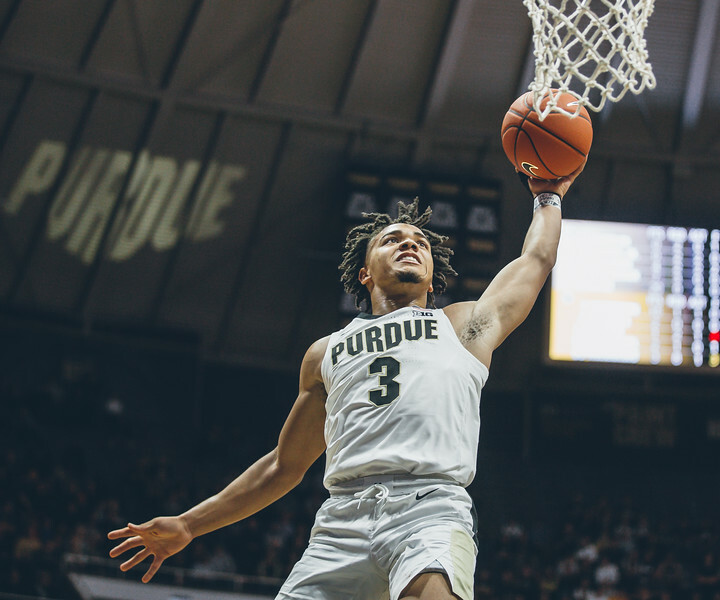 Carsen was looking towards the rafters, and you know that his number will forever be up there with the other Purdue greats. Now that he has announced that he is leaving it makes it that much more of a poignant photo. 3. The last action shot on the countdown is of Carsen driving. He just made it look so easy at times. In the photo he is head and shoulders above everyone else, and that is just how he played the game. 2. During the annual t-shirt game I made this photo during the intros. I really liked it for some reason ever since then. 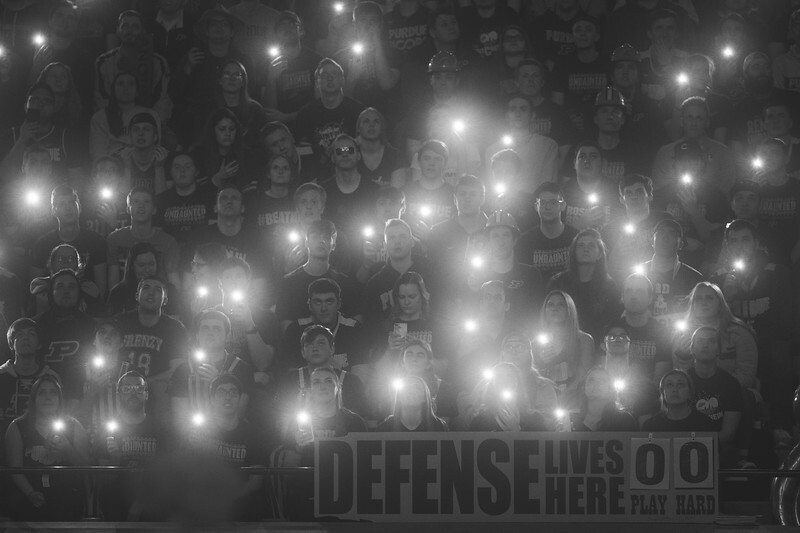 I love the way that Purdue led the way in their intros. I have shot them every which way trying to come up with new ways to show it off. This was just another of those angles. I did not go up into the stands to make this photo. I had another idea in mind. In fact when I first saw a fist enter my frame I would not say that I was pleased. Once I looked at who put the fist in my frame I knew for certain what the subject of the frame should be. I actually moved down to put this young man more into my photo. I had no idea of what his story was other than he just looked cool I wish that I had brought a flash for some fill, but yet again this was not the intent when I made the photo. 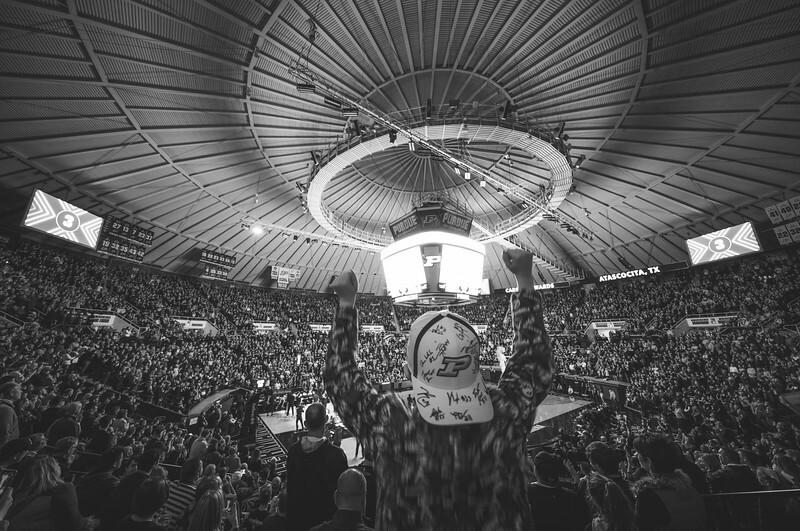 I put this at number one because this is how I feel every time that I set foot in Mackey Arena. I have not always been a Purdue basketball fan. I went to my first game in the late 90’s, but it wasn’t until I became a season ticket holder in 2005 that I really feel in love with the place. Over the course of the last couple of years I have been pulled away a bit with other work. I love making pictures so I will go anywhere to do that. 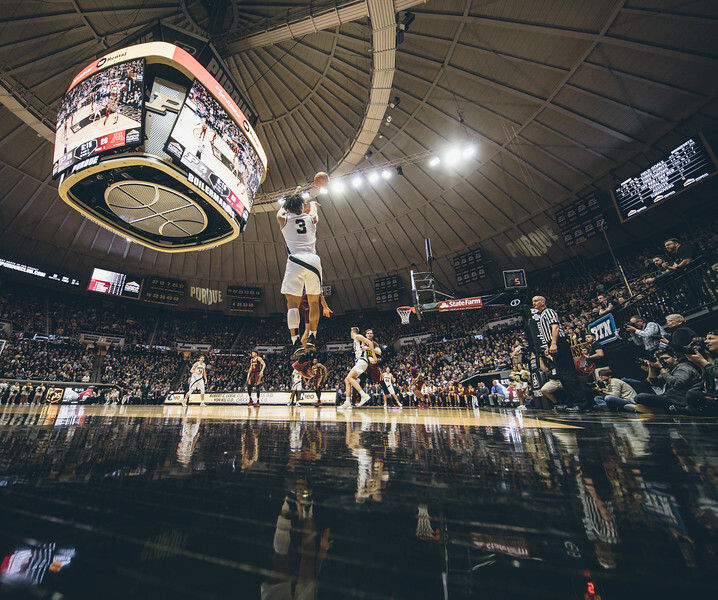 Getting to shoot so much in Mackey this past year was amazing though. Being a small part of a great team is an experience that I will never forget. These nineteen images are part of a great year being back at home.